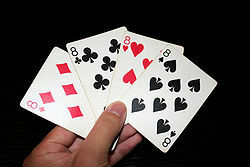 In Crazy Eights, playing an 8 card will change the current suit of the game. පිස්සු අට (ඉංග්‍රීසි: Crazy Eights) යනු දෙදෙනෙකුට වඩා වැඩි දෙනෙකුට ක්‍රීඩාකල හැකි කාඩ් ක්‍රීඩාවකි. මේ පිටුව අන්තිමට සැකසුවේ 1 ඔක්තෝබර් 2017 දින දී, 06:41 වේලාවෙහිදීය.